Ikea have submitted plans for a 47 metre (150 ft) tall pole at their forthcoming Greenwich store with an illuminated Ikea sign on top. In recent years Sainsbury’s in Charlton had problems getting signage approved at the top of their retail shed which could point towards issues with this mast. It was recently revealed that Ikea’s planned opening date has been delayed and they will miss an opening in time for Christmas this year. 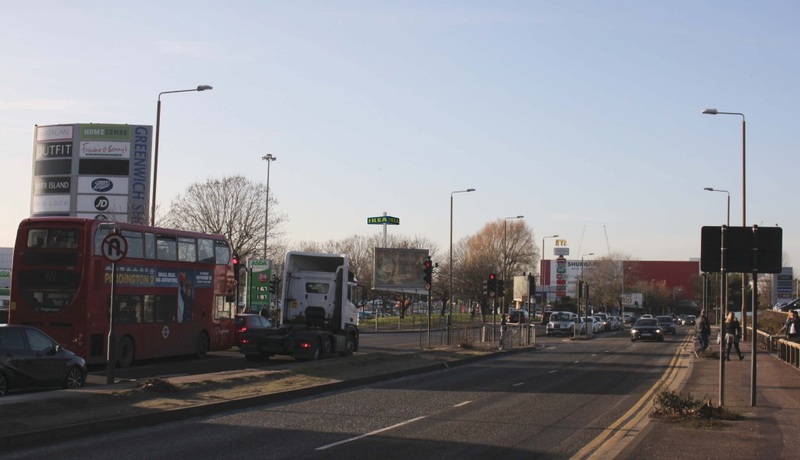 The prospect of an Ikea has been welcomed by many though concerns are widespread about additional traffic and pollution around the Blackwall Tunnel and surrounding area. 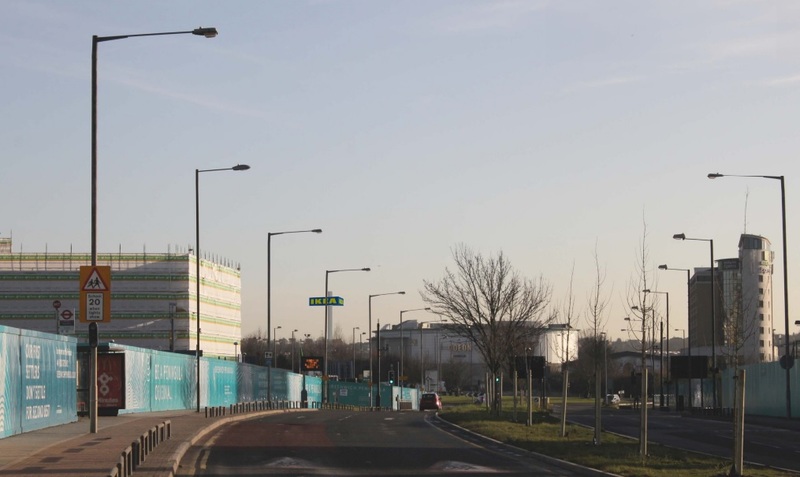 Greenwich council will receive millions from Ikea to mitigate impacts from the development but there’s no sign of street improvement work starting soon, nor of any consultation into exactly what work will be undertaken. 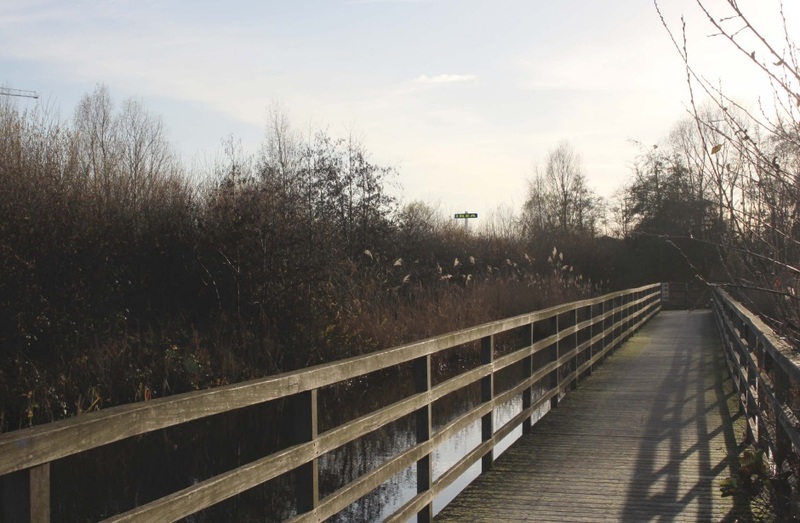 Numerous other developments in the area have brought the authority many millions of pounds in recent years to improve local streets and public spaces yet hasn’t been spent, in some cases for many years and now in danger of being lost. The aforementioned Sainsbury’s superstore brought in £514,000 around four years ago and is still unspent. Have you seen it recently? It’s very much underway and the basic shape of the building is in place. The article refers to “no sign of work starting soon” on street improvements. The Ikea building has begun, obvious;y. But it is not obvious how the council will spend the millions on improving roads and street furniture. I covered the construction of the building recently. The lack of action was in relation to street alterations. Not wholly related to article but I’m curious actually- is there any legislation that requires contributions to be spent within a certain vicinity of a development, or does it just go to the councils overall infrastructure development pot? Under recent Community Infrastructure Levy rules a minimum of 15% must be spent locally. If an area has a Local Plan it’s 25%. Some authorities have decided to spend 25% locally regardless of a Local Plan being adopted. Greenwich have stuck with the legal minimum of 15%. With Section 106 it could be pooled and spent in other areas. Greenwich Officers and Councillors often stated it couldn’t and didn’t respond when evidence showed how how that happened elsewhere (eg in Southwark borough to improve estates and parks). And their claims didn’t explain how money gained from more deprived parts of the borough were sent to Greenwich town centre in previous years, for example. As a result many areas have not benefited across Greenwich borough. This is surely a bad joke? yes, I see greenwich council making millions from this project, and set to make extra more millions in the long term. No sign of infra structure improvement. Over the last couple of decades thousands of homes have been built in the borough, bringing in more revenue in council tax, on top of about 6% increase in 2018/19, and more homeless have been put in temporary accomodation. Unless my thinking is flawed, Something is not adding up. The current regime is not capable of managing its finance/budgets. Chance to definitely consider & weigh up things in the next by-election. Those responsible for giving planning permission to Ikea should hang their head in shame. The Blackwall tunnel will be even more hellish than it is already. It’s absolutely ridiculous. @Edmund: I disagree. I welcome the coming of IKEA to Greenwich – no more schleping out to the Purley Way – but I have now moved out of Greenwich (top of Westcombe Hill) to adjoining Lewisham and the journey by bus if I don’t intend to buy anything heavy or awkward, will take longer. Generally, I imagine that the height of the pole with sign is to make it visible from quite a distance and being on top of the building, who would inconvenience? In my opinion the pole will be an eye sore! Plus the road layout (roundabouts and various bottlenecks) in the area is so terrible it is going to be horrendous for traffic. I think it will turn off some potential customers visiting the shops. It’s been mad today. The A102 into the tunnel has been busy all day (currently so), which has had a knock on effect on the local roads. Throw in a football match, a big event at the O2, the retail parks at their weekend peak trading and then IKEA it’s gonna be gridlock. And to rub our noses in it the cheeky sods want to stick a giant illuminated totem pole in the middle of the chaos. You’ve got to be joking, that mast would be awful! I quizzed one of the peninsula councillors about the missing section 106 money and was told that it had been pooled to pay for the new St Mary Magdalene school on the peninsula. Don’t know if he meant all of the section 106 money in the council’ s coffers or just money from Knight Dragon. Either way, I am not sure the council should be spending its money on funding a church school. you can ask, but they can say anything … greenwich council is riddled with bad wood in recent years .. in case no one has noticed. This overbearing sign will dominate the whole area. No example of photos to show how the sign will affect views in the Westcombe Park conservation area and the views from Greenwich Park!! There is no need for a Navigation Tower to point out where the store is. Cars have sat navs or customers have smartphones with google maps and Bus drivers know their routes, this is just a large poorly designed advertising sign!! As you walk down Beaconsfield Road, you can see the huge Primark sign on Bugsby Way. Not much difference in my opinion. Can we have the sports field back please? There is absolutely no doubt that Ikea will cause gridlock in the area and the Blackwell Tunnel will grind to a halt at times due to Ikea. Ikea is a different sort of shop, people go there for a day out and window shop – not just to buy that thing. I wonder if the traffic assessments were done before the other new shops were built (M+S/Primark/Next etc) and are still valid. Think of Christmas where there was actually gridlock. I was hoping that cash would go to address the traffic bottlenecks and bad road design, but nothing is being done at the moment. If the many laypeople who have voiced concern at the potential traffic problem are correct, I really hope Ikea’s opening hours are curtailed and the people connected with the planning are reprimanded. So many complaints and votes of no confidence than support for this project. A very bad move by greenwich council. I like to see ikea development in progress torn down. This is madness .. has anyone questioned or investigated planning officers as a precaution to detect any corruption/bribery, and age old culture in town planning. IKEA would not need to bribe Greenwich council to allow it to build a store in the borough as its stores as beloved by millions. There will inevitably be gridlock on the weekends especially, but citing an IKEA in an area surrounded by new and upcoming residential development is a logical move. Further, there is very little room for road improvement given the dirty, great Blackwall Tunnel approach road that cuts flies over East Greenwich and affects local roads.